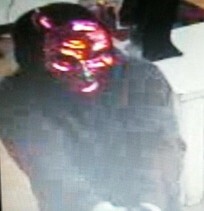 Robbery suspect who targeted the Dairy Queen in Montague. Photo courtesy of the New Jersey State Police. The New Jersey State Police Sussex Station is seeking the public’s help with identifying a suspect wanted for the armed robbery of a Dairy Queen located in Montague Township. It is believed that this suspect committed a similar armed robbery on the same day at the Days Inn in Deer Park, N.Y.